The Ariane 5 ES launcher photographed on 14 February 2010 during transfer from the Final Assembly Building (BAF) to the Launch Zone (ZL-3), at the Ariane Launch Complex no. 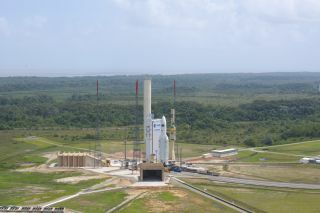 3 (ELA-3) of the Guiana Space Centre, Europe's space port. This story was updated Feb. 16 at 10:25 a.m. EST. The European Space Agency is once again counting down to launch a huge cargo ship toward the International Space Station today (Feb.16) after a one-day delay that may force NASA to push back its own flight of the shuttle Discovery next week. The robotic spacecraft called the Automated Transfer Vehicle 2 — at more than 22 tons (about 20,000 kilograms), the heaviest European spacecraft ever built — is scheduled to blast off from the Guiana Space Center in Kourou, French Guiana, at 4:50 p.m. EST (2150 GMT). An Ariane 5 rocket will boost the spacecraft into orbit. The mission was delayed from yesterday due to "a measurement anomaly" in the rocket's super-chilled liquid oxygen propellant tank, ESA officials said. The ATV-2 space freighter carries the name of Johannes Kepler, after the German astronomer and mathematician who lived in the 16th and 17th centuries. ESA plans to fly at least five ATV cargo ships to support the International Space Station. The European Space Agency's ATV-2 Johannes Kepler during transfer from S5C to S5A, 19 November 2010, Europe’s Spaceport in Kourou. If the ATV Johannes Kepler launches today, NASA will have to delay its own flight of the space shuttle Discovery by one day because of traffic concerns at the space station, NASA officials said. Discovery was slated to launch toward the International Space Station on Feb. 24 – one day after the Johannes Kepler was scheduled to arrive at the orbiting laboratory. NASA opted to delay the launch of Discovery until Feb. 25, to give the Johannes Kepler time to launch, U.S. space agency officials said. But if the European cargo ship does not launch today, it would have to stand down until Friday, Feb. 18, before making its next launch attempt. If that situation arises, NASA would stick to Discovery's original Feb. 24 launch date. Top NASA mission managers plan to make final decision on Discovery's launch date at the end of this week. Automated Transfer Vehicles are ESA's contribution to delivering equipment and supplies to astronauts living on the International Space Station. The first of the fleet, the ATV-1 Jules Verne, flew to the space station in 2008. Today's launch also marks the 200th flight for the European-built Ariane rocket family, which is overseen by launch service provider Arianespace. The Johannes Kepler is packed with 7.1 tons of supplies. The average ATV load is about 6 tons, but modifications to the Ariane 5 rocket allow the extra weight, ESA officials said. The cargo packed inside the Johannes Kepler includes 3,527 pounds (1,600 kg) of equipment and other dry supplies, 1,873 pounds (850 kg) of rocket propellant for the station's thrusters and 220 pounds (100 kg) of oxygen for the station's crew. Arianespace officials have said the total weight of the Johannes Kepler and its 7.1 tons of cargo adds up to about 44,202 pounds (20,050 kg). ESA's unmanned cargo ships are disposable craft designed to fly themselves once they reach orbit. The Johannes Kepler, for example, was scheduled to dock itself to a port on the end of the space station's Russian-built Zvezda module on Thursday, Feb. 24. Astronauts living aboard the International Space Station have an abort button, which they can use to postpone the Johannes Kepler's approach if it veers off course. If an abort occurs, the craft will move out to a safe distance and then await approval to make another attempt, ESA officials have said. Backdropped by the blackness of space, the European Space Agency's (ESA) "Jules Verne" Automated Transfer Vehicle (ATV) begins its relative separation from the International Space Station. The ATV undocked on Sept. 5, 2008 and was placed in a parking orbit for three weeks, before deorbiting on Sept. 29 and burning up in the Earth's atmosphere. ATV spacecraft form part of the international fleet of robotic cargo ships to keep space station crews stocked up. Japan's second robotic craft – known as the H-2A Transfer Vehicle, or Konoutori (Japanese for "White Stork") – arrived at the space station on Jan. 27. Russia followed suit with its unmanned Progress 41 spacecraft, which launched on Jan. 28 and arrived two days later. NASA plans to rely on its Russian, European and Japanese partners to deliver cargo to the space station once it retires its space shuttle fleet later this year. The U.S. space agency currently plans three more shuttle flights by July before retiring its three shuttles – Discovery, Atlantis and Endeavour – after 30 years of service. You can watch the launch of the ATV-2 Johannes Kepler live via this European Space Agency link, or by visiting launch service provider Arianespace. You can follow SPACE.com Managing Editor Tariq Malik on Twitter @tariqjmalik.